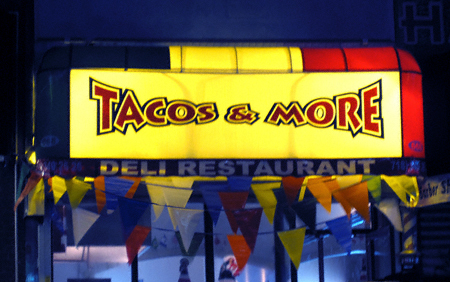 Tacos And More Is Open! Not only are they open for business, but tomorrow (December 27, 2008) they will be strutting free samples of their stuff! You can get a feel for their offerings here and here (no takeout menus yet— sorry— but be advised they are not very vegetarian friendly— needless to say vegan kibble is completely out of the question). Nonetheless I’d love to hear what you meat (and egg) eaters have to say! One Comment on Tacos And More Is Open! I’ll have to check this place out.